Generally, you will be able to resupply every 4 to 9 days along the GDT via a mailed package and/or purchasing food from a local store. There are only two places directly on the GDT with stores that carry adequate food and supplies for long-distance backpacking (Waterton and Jasper) so preparing resupply packages is an essential part of a long-distance journey on the GDT. Waterton townsite has a small grocery store, an outdoor gear shop and several restaurants. While not directly en route, Blairmore, Pincher Creek, Banff, Lake Louise and Golden all have supermarkets, outdoor gear shops and restaurants. There are small stores in Coleman, Boulton Creek Trading Post, Field and The Crossing Resort where limited food and supplies are available, catering mostly to vehicle camping. Jasper has two supermarkets, a few outdoor gear shops and several restaurants. Near the Mount Robson Visitor Centre is a cafe and a small convenience store. STOVE FUEL: Isobutane/propane cannisters, white gas and alcohol stove fuel are usually available in Waterton, Pincher Creek, Blairmore, Boulton Creek, Banff, Lake Louise, Golden and Jasper. Alcohol fuel is also available in Coleman and at The Crossing Resort. Backpacking stove fuel is not available at Field or Mount Robson Visitor Centre. Be aware of the hours of operation for the resupply locations. You may find yourself racing to beat closing time, or waiting for it to reopen. 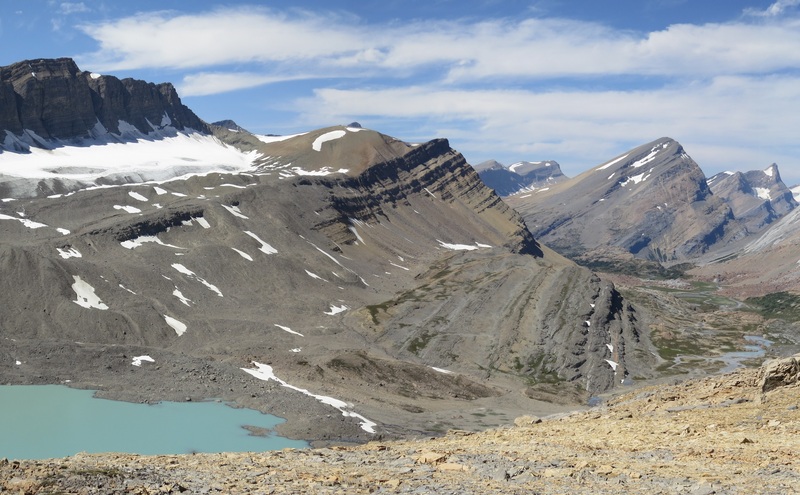 The standard policy is that the packages will be held for 15 days so write “Please hold for Great Divide Trail hiker” with your anticipated date of arrival to ensure the package will be there when you arrive. Allow plenty of time for shipping as some remote locations may take up to two weeks to receive a package. You will need government issued photo id to pick up your package from most post offices. For government Post Offices, mail your package general delivery. Large heavy packages might not be accepted. A good rule is maximum 25 lbs (11 kg) per package. If you are packing food for more than 2 people, split into 2 packages. If using a courier, only prepaid couriered packages will be accepted. IMPORTANT: Ensure your resupply package is tightly sealed (i.e. mouse-proof) and contains no perishable items or hazardous materials. When in doubt, call or email in advance to confirm that the resupply location will accept your resupply package. A ‘bounce box’ is a package that you continually mail ahead to yourself as you travel along the trail, giving access to your desired personal items without having to carry them. The bounce box can include things like: books, maps, camera charger, town clothes, replacement shoes or socks, hiking gear, first aid materials, etc. Be aware that using a bounce box can be expensive. Waterton townsite has several hotels, restaurants, coffee shops, a small grocery store, a laundromat, an outdoor gear shop, a campground, a Parks Canada office and a shuttle service office. Castle Mountain Ski Resort is a remote location and has limited/variable hours so call ahead to arrange resupply. Their guest services office is open Monday to Thursday from 9am to 3pm and the pub is open Friday (3-10pm), Saturday (11am-10pm) and Sunday (9am-3pm). The hostel is open daily in the summer. Coleman has two motels, a few B&Bs, several restaurants and a convenience store. Blairmore has two motels, a few B&Bs, a campground, several restaurants, an outdoor gear shop, and a supermarket. Safe Haven owners, Alannah and Dan offer a discount to GDT hikers which includes meals, laundry service, wifi, a beer and they will drive hikers to Blairmore for supplies. Boulton Creek Trading Post does not accept resupply packages but has a small store that sells camping supplies and groceries, and a concession that sells baked goods and ice cream. This a remote location and staff pick up packages in Canmore once per week so allow plenty of time for shipping as it may take up to two weeks to receive a package. Maximum 25 lbs (11 kg) per package. If using a courier, only prepaid couriered packages will be accepted. Free wifi is available at the visitor centre. Banff-Sunshine offers a backcountry cache service and shuttle service to Sunshine Village. Package delivery and storage costs $25+GST per package. This fee is waived if you spend a night at Sunshine Mountain Lodge. Sunshine Village has a restaurant, a pub and a cafe (w/ free wifi). Call or email Banff-Sunshine in advance to make package delivery arrangements. To get to Banff, hikers can walk down to the base of Sunshine ski hill (+5 km) and catch the FREE shuttle bus to Banff townsite from the base. Alternatively the gondola from Sunshine Village to the base of the ski hill runs 7 days per week for a fee. For more information on fees, schedules, or to make a reservation, check out their website. Banff has many hotels, B&Bs, restaurants, a hostel, two supermarkets, a laundromat, several outdoor gear shops, a nearby campground, hot springs, and a Parks Canada office. Field has a hotel with a restaurant/pub and coin laundry, a few B&Bs, a hostel (see below), a cafe that sells some groceries, and a Parks Canada office. The hostel books up in the summer, so if you want to stay overnight reserve in advance. The Crossing Resort has accommodation, laundry, a cafeteria, a restaurant with all-you-can eat breakfast and lunch buffets, a pub and a general store that carries camping supplies and some groceries. Wifi is available for a fee. Jasper has several hotels, B&Bs, restaurants, a hostel, two supermarkets, a laundromat, a few outdoor gear shops, a nearby campground and a Parks Canada office. Tel: 250-566-4038 *This is a remote location with periodic package pick-up so call in advance to confirm arrangements for your resupply package. Near the Mount Robson Visitor Centre is a cafe, a small convenience store and a campground.